Rollup creates one or more output records from one or more input records. Rollup receives potentially unsorted data through the single input port, transforms it and creates one or more output records from one or more input records. The component can send different records to different output ports as specified by the user. Rollup does not propagate metadata. Rollup has no metadata template. Input and output metadata fields can have any data types. You may need a metadata for the accumulator record in rollup transformation. Key according to which the records are considered to be included into one group. Expressed as a sequence of individual input field names separated from each other by a semicolon. For more information, see Group Key. If not specified, all records are considered to be members of a single group. The ID of metadata that serves to create group accumulators. Metadata serves to store values used for transformation of individual groups of data records. Definition of the transformation written in the graph in CTL or Java. The name of an external file, including the path, containing the definition of the transformation written in CTL or Java. Transform class  The name of an external class defining the transformation. Encoding of external file defining the transformation. By default, records are considered to be sorted. Either in ascending or descending order. Different fields may even have different sort order. If your records are not sorted, switch this attribute to false. By default, records with null values of key fields are considered to be equal. If set to false, they are considered to be different from each other. One of these must specified. Rollup requires transformation. You can define the transformation using CTL (see CTL interface) or Java (see Java Interface). The flow of function calls in a rollup transformation is depicted below. If any optional function (except functions for error handling) is not used, the position of unimplemented function from diagram is skipped. If you do not define Group accumulator metadata, VoidMetadata is used in transformation functions. The transformation uses a CTL template for Rollup, implement a RecordRollup interface or inherit from a DataRecordRollup superclass. Below is a list of RecordRollup interface methods. For detailed information about this interface, see Java Interface. Once you have written your transformation, you can also convert it to Java language code by clicking a corresponding button at the upper right corner of the tab. You can open the transformation definition as another tab of the graph (in addition to the Graph and Source tabs of Graph Editor) by clicking a corresponding button at the upper right corner of the tab. If groupAccumulator is not defined, VoidMetadata Accumulator is used in the function signature. Called repeatedly, once for the first input record of each group. Description Initializes information for specific group. Called repeatedly (once for each input record of the group, including the first and the last record). Called after the initGroup(groupAccumulator) function has already been called for the whole group. Updates information for specific group. If updateGroup() fails and user has not defined any updateGroupOnError(), the whole graph will fail. If any of the input records causes a failure of the updateGroup() function and if user has defined another function (updateGroupOnError()), processing continues in this updateGroupOnError() at the place where updateGroup() failed. The updateGroup() passes to the updateGroupOnError() error message and stack trace as arguments. Called repeatedly, once for the last input record of each group. Called after updateGroup(groupAccumulator) has already been called for all input records of the group. 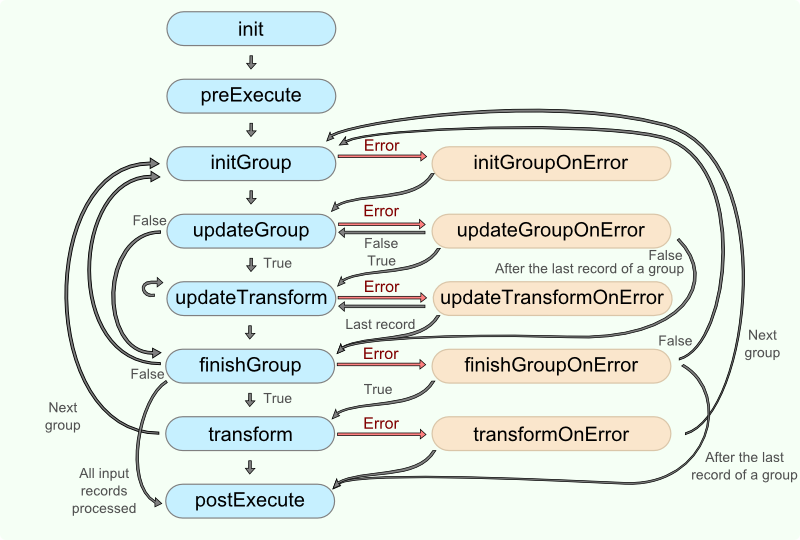 If finishGroup() fails and no finishGroupOnError() is defined, the whole graph will fail. If any of the input records causes fail of the finishGroup() function, and the finishGroupOnError() function is defined, processing continues in the finishGroupOnError() at the place where finishGroup() failed. The finishGroup() passes to the finishGroupOnError() error message and stack trace as arguments. Integer numbers. For more information, see Return Values of Transformations. Called repeatedly as specified by user. Called after updateGroup(groupAccumulator) returns true. The function is called until SKIP is returned. It creates output records based on individual record information. If updateTransform() fails and no updateTransformOnError() is defined, the whole graph will fail. If any part of the transform() function for some output record causes fail of the updateTransform() function, and if another (updateTransformOnError()) is defined, processing continues in this updateTransformOnError() at the place where updateTransform() failed. The updateTransformOnError() function gets the information gathered by updateTransform() that was get from previously successfully processed code. The error message and stack trace are passed to updateTransformOnError(), as well. Called repeatedly as specified by the user. Called after finishGroup(groupAccumulator) returns true. It creates output records based on all of the records of the whole group. If transform() fails and no transformOnError() is defined, the whole graph will fail. If any part of the transform() function for some output record causes fail of the transform() function, and if the transformOnError() function is defined, processing continues in the transformOnError() at the place where transform() failed. The transformOnError() function gets the information gathered by transform() that was get from previously successfully processed code. Also the error message and stack trace are passed to transformOnError(). Invocation Called if initGroup() throws an exception. Called if updateGroup() throws an exception for a record of the group. Description Updates information for specific group. Invocation Called if finishGroup() throws an exception. Description Finalizes the group information. Integer numbers. For detailed information, see Return Values of Transformations. Invocation Called if updateTransform() throws an exception. Description It creates output records based on individual record information. Invocation Called if transform() throws an exception. Description It creates output records based on all of the records of the whole group. Description Prints an error message specified and invoked by the user. Called in any time specified by the user (called only when either updateTransform(), transform(), updateTransformOnError() or transformOnError() returns value less than or equal to -2). May be used to allocate and initialize resources required by the transform. All resources allocated within this function should be released by the postExecute() function. Invocation Called during each graph run before the transform is executed. Should be used to free any resources allocated within the preExecute() function. Invocation Called during each graph run after the entire transform was executed. All of the other CTL template functions allow to access neither inputs nor outputs or groupAccumulator. Input records or fields are accessible within the initGroup(), updateGroup(), finishGroup(), initGroupOnError(), updateGroupOnError() and finishGroupOnError() functions. They are also accessible within the updateTransform(), transform(), updateTansformOnError() and transformOnError() functions. Output records or fields are accessible within the updateTransform(), transform(), updateTansformOnError() and transformOnError() functions. Group accumulator is accessible within the initGroup(), updateGroup(), finishGroup(), initGroupOnError(), updateGroupOnError() and finishGroupOnError() functions. It is also accessible within the updateTransform(), transform(), updateTansformOnError() and transformOnError() functions. Remember that if you do not hold these rules, NPE will be thrown. The transformation implements methods of the RecordRollup interface and inherits other common methods from the Transform interface. See Common Java Interfaces and Public CloverDX API. Initializes the rollup transform. This method is called only once at the beginning of the life-cycle of the rollup transform. Any internal allocation/initialization code should be placed here. This method is called for the first data record in a group. Any initialization of the group accumulator should be placed here. This method is called for the first data record in a group. Any initialization of the group "accumulator" should be placed here. Called only if initGroup(DataRecord, DataRecord) throws an exception. This method is called for each data record (including the first one as well as the last one) in a group in order to update the group accumulator. This method is called for each data record (including the first one as well as the last one) in a group in order to update the group accumulator. Called only if updateGroup(DataRecord, DataRecord) throws an exception. This method is called for the last data record in a group in order to finish the group processing. This method is called for the last data record in a group in order to finish the group processing. Called only if finishGroup(DataRecord, DataRecord) throws an exception. This method is used to generate output data records based on the input data record and the contents of the group accumulator (if it was requested). The output data record will be sent to the output when this method finishes. This method is called whenever the boolean updateGroup(DataRecord, DataRecord) method returns true. The counter argument is the number of previous calls to this method for the current group update. See Return Values of Transformations for detailed information about return values and their meaning. This method is used to generate output data records based on the input data record and the contents of the group accumulator (if it was requested). Called only if updateTransform(int, DataRecord, DataRecord) throws an exception. This method is used to generate output data records based on the input data record and the contents of the group accumulator (if it was requested). The output data record will be sent to the output when this method finishes. This method is called whenever the boolean finishGroup(DataRecord, DataRecord) method returns true. The counter argument is the number of previous calls to this method for the current group. See Return Values of Transformations for detailed information about return values and their meaning. This method is used to generate output data records based on the input data record and the contents of the group accumulator (if it was requested). Called only if transform(int, DataRecord, DataRecord) throws an exception. You have a list of records containing name, email address and phone number. Records do not have all fields filled in. Records are sorted according to the field name. Merge together data of records with the same name. If more records with the same name have the same field filled in, use the last one. Input and output metadata (updateRecord) have fields name, email and phoneNumber. Use the attributes Group key, Group accumulator and Transform of Rollup. Input records containing name, group and email have a multivalue field email. Split input stream to two data streams: one with name and group, the other one with name and email. The output records will be loaded into a database without support of multivalue fields. Input metadata users has fields name, group and email. Output metadata users2 has fields name and group, output metadata emails has fields name and email. Use the Rollup attributes Group key, Group accumulator and Transform. The transformation above requires the field user to be unique. To process a large number of records, sort records first and than use Rollup instead of using Rollup with the Sorted input attribute set to false.